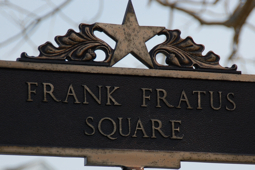 Frank B. Fratus was one of eight Provincetown men killed in World War I. Two decades after the armistice, with another war looming in Europe, five of these men were memorialized in the renaming of five principal intersections: Manuel Lopes at Railroad Square, Everett McQuillan at Depot Square, Norman Cook at Town Hall Square and Louis Ferreira at Kelley’s Corner, also known — then and now — as the Turn. (“Vets to Dedicate Five Town Squares,” The Advocate, March 24, 1938.) Lewis A. Young had already been commemorated in the renaming of the Veterans of Foreign Wars post, while Antone Light and Lewis Morris were memorialized by the American Legion.